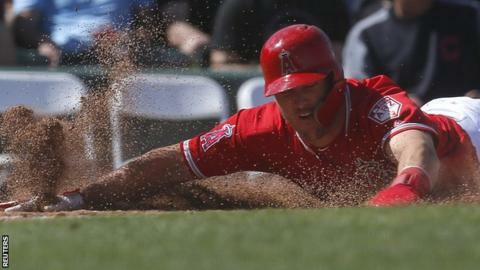 Baseball star Mike Trout has signed the most lucrative deal in sport - a 12-year extension worth a reported $426.5m (£324m) with the Los Angeles Angels. The contract for the 27-year-old American amounts to $35.54m (£27m) per year until 2031, according to the Los Angeles Times. The deal eclipses boxer Canelo Alvarez's deal with DAZN, worth $365m (£275m) over five years. The new Major League Baseball season started on Wednesday. Trout would have become a free agent at the end of the 2020 season upon the completion of the six-year $144.5m (£110m) deal he signed in 2014. And his contract, which has no opt-out clause, is the first valued at over $400m (£304m) in Major League history, surpassing the $330m (£251m) deal Bryce Harper agreed with the Philadelphia Phillies in February. "This is where I wanted to be all along," Trout said. "I have enjoyed my time as an Angel and look forward to representing the organisation, my team-mates and our fans for years to come." The two-time winner of the American League's Most Valuable Player award has a career batting average of .307, with 240 home runs, 648 runs batted in, 793 runs and 189 stolen bases in 1,065 games. While Trout's reported deal eclipses Alvarez's contract as a total amount, when broken down on an annual basis he would earn less than the Mexican, as well as the likes of Barcelona footballer Lionel Messi, who has yearly earnings of $84m (£64m), according to Forbes. The magazine had boxer Floyd Mayweather as 2018's best paid athlete, with earnings of $275m (£207m).